For the first couple of weeks of March, you were sure the world had flipped upside down. Paul Stastny, Max Pacioretty and the recently acquired Mark Stone were the Golden Knights’ top line. They were competing. They were scoring. They were dominating at both ends of the ice. 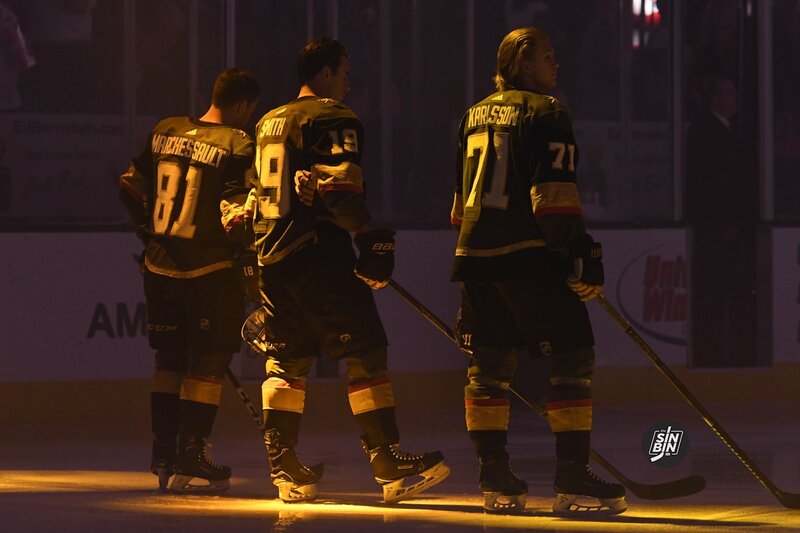 It made you wonder what was going on with William Karlsson, Jonathan Marchessault and Reilly Smith, the Knights’ regular No. 1 unit. They had been running hot and cold most of the year and if you were the opposing team’s coach, you had greater concerns for the Stastny line. But as we have seen the past week, Karlsson, Marchessault, and Smith are playing like the top line they should be. And could the timing be better? We’re in the final push to the playoffs. The Knights, who are likely to remain in third place in the Pacific Division, have 41 wins and 87 points with nine games to play, seven behind second-place San Jose and nine in front of Arizona, which is batting for the final wild card spot. 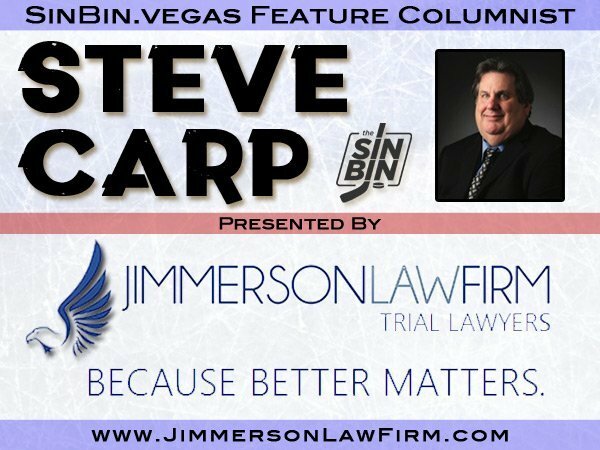 And while it’s easy for us to look ahead to the second week of April and the Stanley Cup Playoffs, if you’re Karlsson, Marchessault and Smith, these final 2 1/2 weeks, beginning Thursday at T-Mobile Arena against Winnipeg, are critical in building momentum and confidence. You want to go into the postseason playing your best hockey and we’re seeing signs of that from the line. That’s a combined seven goals and 13 assists for 20 points, an average of four points a game for the line. Any coach would take that kind of productivity. Part of it is Smith is 100 percent healthy and he has remained on the line after Gerard Gallant moved him around after he returned to the ice after he missed nearly a month in early January with an injury. When he’s right and playing his game, Smith is arguably the best two-way winger on the Knights, though some may point to Stone and say he has supplanted Smith in that role. Marchessault? His thing is putting the puck in the net. And with back-to-back two-goal games, he may be finding his groove. Granted, he beat a sieve of a goalie Sunday in Edmonton’s Mikko Koskinen, who could have the worst glove I’ve seen from an NHL goalie in years. But think about all the times we’ve seen Marchessault look up to the heavens after hitting a crossbar, missing an open net or getting robbed by the other team’s goalie? Things tend to even themselves out in hockey and if you’re a goal-scorer like Marchessault, your puck luck ultimately finds its level. As for Karlsson, he appears to have gotten his speed back to elude the extra attention he has received all year. He’s setting up his teammates and he finally reached the 20-goal mark Monday in the 7-3 win over San Jose. I wonder if he’s blocking out any thoughts about his next contract and just focusing on his job on the ice better. I’m sure that’s what he’d say, as all players do. Very few grouse publicly about their contract. Many have wondered what has happened to Wild Bill this year. It was going to be hard to duplicate last year’s career-best 43 goals and 78 points. But if you took last year out of the equation and saw what Karlsson has accomplished this year compared to his days in Columbus with the Blue Jackets and his first year in Anaheim with the Ducks, this would have been a breakout year for him. The best Karlsson ever did prior to arriving in Vegas was nine goals and 20 points with the Jackets in 2015-16. And if you look at the Knights statistics, the line is in the top four in terms of overall scoring. Marchessault leads the team in both goals (24) and points (53). Smith is tied with Karlsson for third in scoring overall with 15 goals and 48 points, his 33 assists leads the team. Karlsson has 20 goals and 48 points. If the trio can continue to put up points, it’s going to be a tough situation for the opposing team in the playoffs when it comes to matchups. Do you put your top line out against Stastny, Pacioretty, and Stone? Or do you run them out against Karlsson, Marchessault, and Smith? I talked Monday about how Alex Tuch’s being on the third line can help him offensively come the postseason as he won’t face the other team’s top line from a defensive standpoint. The same could hold true for Karlsson’s line. If you’re Calgary’s Bill Peters, you may want to match up your best line against Stastny’s. San Jose’s Peter DeBoer could opt to put his top line against Karlsson’s. Either way, it gives Gallant tremendous flexibility in terms of matching lines. If both lines are producing, and if Tuch, Cody Eakin and Tomas Nosek continue to produce, it will make Vegas a tough out in the playoffs. That is assuming, of course, that the Knights have a healthy Marc-Andre Fleury in goal. Remember, not every team had Washington’s ability to shut the Knights down the way the Capitals did in the Stanley Cup Final after Barry Trotz astutely adjusted following losing Game 1. You have to have the personnel to execute a strong defensive system to contain what Vegas does. And in watching the Western Conference this year, I’m not sure anyone can do it consistently over a seven-game series to contain all four lines. But let’s see what transpires these last nine games. If Karlsson, Marchessault and Smith can keep building momentum and accruing goals and points, Gallant may find himself with two top lines come playoff time. And wouldn’t that be a nice problem for him to have?